The Armoire can be used for many storage needs including Entertainment Center. Popular choice from our log furniture line. 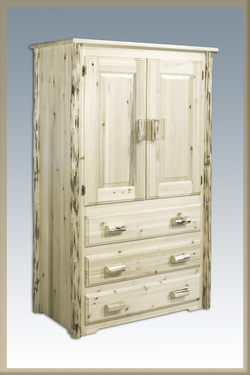 Solid pine armoire with log trim and handles. Made from solid pine panels and accented with hand-peeled lodge pole pine trim and door handles, the armoire has style to spare. Two raised panel doors conceal the large storage area. The three drawers employ epoxy coated, easy-glide drawer slides. 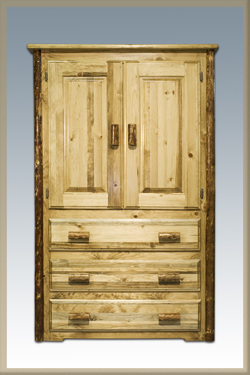 On the inside, the armoire has a one inch dowel, spanning the width, for hanging your wardrobe. Opening measures 40W 21D 38H. Choose between Natural , Clear Lacquer Finish or Glacier Style.